A tornado threatens the community. A train derails nearby and mass amounts of chlorine tanks are ruptured. A nearby nuclear facility experiencing an emergency. A levy fails due to recent flooding. An active shooter incident is ongoing at a nearby high school. There are so many types of emergencies that rural communities face and it is critical that those who need to know what is going on, are made known of what is occurring. Who are the ones that need to know this information the most? The Community! Residents, business leaders and public safety officials – tourists, visitors and those travelling through the area – The People are our greatest stakeholders when it comes to the business of emergency management. It is critical that we alert The People during times when information is so relevant that it will increase lifesaving efforts. But public emergency alerts are a challenge to emergency management officials, especially in rural and remote environments. In a community where budgeting, personnel and resources are limited – the idea of mass notification seems more like a dream than a reality. This isn’t actually the case, though. In most cases, rural communities are simply not utilizing the tools that are available to them. In the article, we will be taking a look at various free tools that can be used as innovative products for sending out mass public emergency alerts for community leaders and emergency management officials located in rural and remote regions. Social Media: Learn it! Know it! Use it! You’d be surprised how many members of your community are connected via-social media. Social media allows people to connect with family and friends, share life’s precious moments and even keep distance friends and relatives informed of what is going on with their loved ones. People of all ages are utilizing social media and social media websites themselves are starting to cater more for ease of use for all ages and internet literacy of people who use their networks. So you will often find young children to senior citizens using social media for various activities. Let’s take a look at the two major social media networks used by people and even governments from all across the nation – Facebook and Twitter. Facebook is a valuable tool for rural emergency management because most of the people living within the community are likely active members of the giant social network. Facebook is free to join and users may create pages for their organization and businesses. Community officials should create a page for their public alert and/or emergency management agencies on Facebook. Then agencies may post messages to warn and/or alerts members of the community of dangers and hazards associated with various events, whether related to a general emergency or a full-scale disaster. In the example image to the left, we see a message being shared by the Lincoln County Emergency Management Agency located in West Virginia. 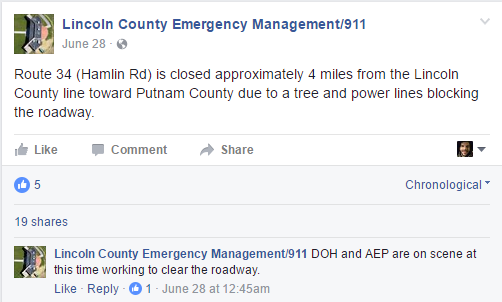 The agency is sharing information about a tree and power-lines being down and blocking the road. This is alerting locals to find alternative routes and also informing them of their potential safety concerns. As we can see, 19 fans of the page have shared this alert with others they connect with on Facebook. Facebook offers agencies the capability of sharing important public alerts while also giving the public the ability to pass on the information. Next, we will take a look at Twitter, a service that is often criticized as a service no one really understands. Twitter is basically a way to get a very short message out to others quickly. For example, there is a tornado watch in your small community and you want to alert your residents. If you have an established Twitter page for the community, you can post a quick message to warning residents about the tornado watch using something like “Tornado Watch for #SmallTownOhio until 5:00 AM. Night time severe weather possible.” With Twitter, your content is limited to 140 characters so messages need to be short but to the point. You can create hashtags which are basically ‘trends’ that other people are sharing. 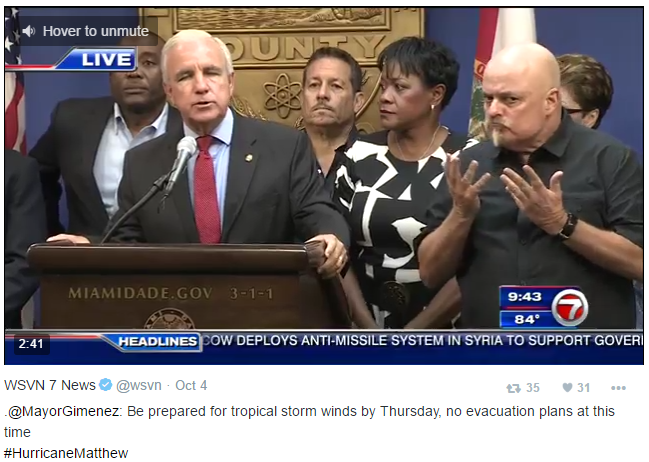 Look at the image to your right – you can see #HurricaneMatthew was the chosen hashtag which at the time was a big trend and therefore a lot people were able to see that particular Twitter message (we call them “Tweets”) following that trending hashtag. 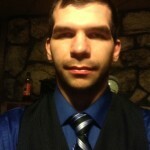 Twitter allows for photo and link submission as well so that you can expand your public emergency alerts. Social media is a popular internet destination. It is critical that all emergency management agencies adopt social media tactics, learn the popular network protocols and use them to their advantage to warn members of their community. You’d be surprised how many people in your community is likely actively involved on Facebook and Twitter. Use that to keep them informed! Try Nixle for Mass Public Emergency Alerts! A popular service among emergency management agencies, police departments, fire and EMS agencies and even organizations, businesses and schools is Nixle – a mass notification system using text alerts. Who doesn’t have a cell phone these days? Not too many people go without their cell phone, even if the phone is considered ‘ancient’ by the massive amounts of smartphone users. Nixle provides a way for emergency management and public safety officials to keep members of their community informed through their comprehensive text message alert system. While Nixle offers paid options, there are also free options available which would likely and significantly benefit rural and remote communities with limited funding to spend on such activities like mass public emergency alerts. Take a look at the image to your left. 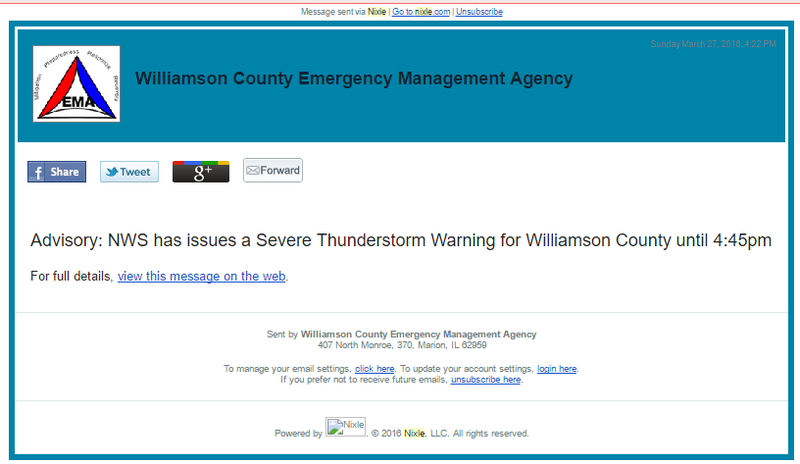 This is a Nixle alert shared via-email (and it can be send through text message as well) about a severe thunderstorm warning that had threatened the rural southern Illinois county of Williamson sent by the Williamson County Emergency Management Agency. This alert had allowed receivers to share the message through various social media networks as well as forward the email to their friends, family members and co-workers. The alert is simple and allows for messages to include links to the full stories located on websites powered by Nixle through the agencies using the service. Take advantage of what is free, today! There are many free opportunities available for sending out public emergency alerts to residents and other stakeholders of your rural communities. Most of these opportunities are on the internet. Now before you assume that not everyone is using the internet, take note that people who are connected to members of your community are likely using the internet and they can share what they have read with others who are not reading what the internet has to offer them. Tell your stakeholders to share the alerts with others who may not be seeing the same message on the internet service you are using – it is as simple as that. I hope you have found this article to be educational for the issue of public emergency alerts and I encourage you to continue exploring for more strategies and tactics on taking advantage of the free opportunities available for your community and/or emergency management agency. Please share this article with others and especially on your social media profiles, pages, groups and other areas where this message could help others out. I’d love to see your comments about more free tactics for rural communities to send out public emergency alerts to their communities. Your site is well written. My area on interest and research is literacy, specifically the grade level and readability of emergency management messages. Your site measured at 9th Grade 6th Month or a readability of 50.9 on a scale where 100 is best. My research found only two county sites below yours out of 57 studied. Most were college level and above. This is excellent communication. I salute you.